Updated: According to investigations by the Palestinian Center for Human Rights (PCHR), and the mother’s testimony, Fawziyah Mahmoud Khamis Salhi (67) said to PCHR’s fieldworker that at approximately 02:00 on the abovementioned day, Israeli forces moved into al-Far’ah refugee camp, south of Tubas. They surrounded the family house of Mohammed Subhi Ahmed Khamis Salhi (33) near an UNRWA School for Girls and the camp sports club, seemingly in order to arrest him. A number of Israeli soldiers jumped from the outer wall of the 1-storey house. Mohammed and his mother then heard noise in the corridor and went out of their bedroom. When his mother saw the soldiers, she stood between them and her son. An Israeli soldier then ordered her to sit on a plastic chair there, but when she refused, the soldier forcefully seated her. She then twice stood between the soldiers and her son. However in the third time she stood, the soldier forcefully pushed her and seated her on the chair. The soldier then pulled out a gun with a silencer and directly fired 5 bullets at Mohammed at point-blank range. As a result, the bullets penetrated his neck, chest, hand, armpit, pelvis and thigh from the left side of his body and killed him in front of his elderly mother. The mother said that she did not hear any sound of shooting, but saw sparkles coming from the gun. After that, her son swayed and fell on the ground. His body was put on a litter and then taken by an ambulance belonging to the Palestinian Red Crescent Society (PRCS) to Tubas Turkish Governmental Hospital in Tubas, where medical sources announced him dead. It should be mentioned that the Mohammed previously served a 3-year sentence in the Israeli prisons. Many Israeli soldiers and undercover officers invaded, on Tuesday at dawn, the al-Far’a refugee camp, north the West Bank district of Tubas, before breaking into the home of a former political prisoner and fatally shooting him in the head in front of his family. 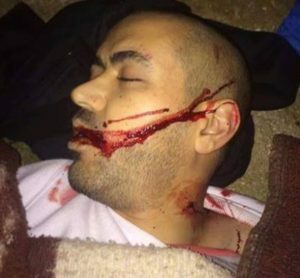 Khaled Mansour, a member of the Political Bureau of the leftist Palestinian People’s Part (PPS), said an Israeli commander executed Mohammad Salhi, 33, with six bullets, including one in the head, from a close range, after invading his home and searching it. Mansour added that many undercover soldiers invaded the Salhi family home, and started shouting at his mother and pushing her around, an issue that forced her son, who thought they were thieves, tried to push them away from her. The soldiers then started firing at the young man, including from point black range, wounding the him with six live rounds, some in his head, before he fell onto the ground and bled to death after the soldiers prevented everybody from approaching him. The soldiers also invaded and searched many homes in al-Far’a, and interrogated dozens of Palestinians while inspecting their ID cards. 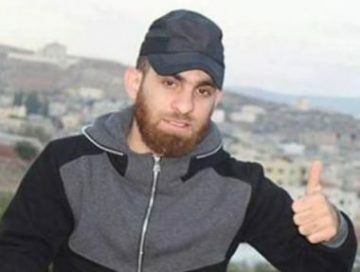 It is worth mentioning that the slain Palestinian is a former political prisoner, who was held by Israeli for three years; he was single while his father died several months ago, and is survived by his mother and sister. Following the attack, the Palestinian Foreign Ministry issued a statement described the Salhi’s execution, in his own home and in front of his family, as an Israeli state-sponsored terrorism. The ministry said the soldiers shot Salhi in front of his mother, and left him to bleed to death, without allowing anybody to render the urgently-needed medical attention to him.